Campus is looking quite different these days. In case you haven't seen it lately, there is a lot of construction going on. Some of it is new construction and some are renovations. In both cases, the buildings need help from IT to be integrated into the campus network. Jeff Jolly, Network Engineer, takes us to the new fraternity complex and over to One Tribe Place to show some of the things IT does to get new buildings online. Zooming out in a golf cart, our first stop with Jolly is the new fraternity complex. We stop in one of the 12 small buildings where he gets everything set-up to install wireless access points in the ceiling. The access points are little white boxes with a light on one corner. Five access points are to be installed in each building; three on the lower level and two on the upper level. Today he is only able to do these installations in one building as construction has to be finished to a certain point before he can install. "We knew we were going to have a lot of work to do this summer with all this construction, but we couldn't do much of it until now. We had to wait until the buildings were ready," Jolly notes. "But now we are slammed." There are many campus projects needing networking services. The new fraternity complex and One Tribe Place certainly need a lot of attention, but there are several other construction projects as well, including the renovation to the Brafferton, the remodel of Tucker Hall and the addition to the Sadler Center. It's not only construction projects needing networking services this summer. The new ID system implementation required all the vending and laundry machines to be networked to accept W&M Express card swipes for payment. Many of these machines had been operating as cash only because they lacked network service outlets (or "network drops" as IT folks call them). Furthermore, the campus Internet connection is being revamped. We are switching providers for our primary Internet service and adding an additional back-up Internet service which will create three layers of redundancy (aka a back-up for our back-up). More to come on this project. Not to mention the usual summer network maintenance that has to be done every year. Back at the fraternity buildings, Jolly is pulled aside by the elevator installer. One of the elevators is apparently having some issues with the telephone connection. Jolly grabs a test phone set from his golf cart and heads around to the back of the building. He mentions that the networking closets were built on the outside of the building which will make it easy for him to go and come as needed. He will not have to disrupt residents during service calls. In most older building these closets are located on the inside of buildings. He opens the networking closet, exposing long strands of multi-colored cables that are bunched together and running along 'D' Rings. All that wiring was completed in the earlier phases of construction. It supports things like the network, door access, alarms, cable service, and analog phone service - like the phone used in the elevators. He plugs in his test phone to the elevator's line and hears voices on the other end. It's working. Before leaving this fraternity building Jolly goes into each room in building. He is checking the installation of the network jacks on the walls. Content with the jack installations, he heads back out to his golf cart and we zoom over to the Community Building. 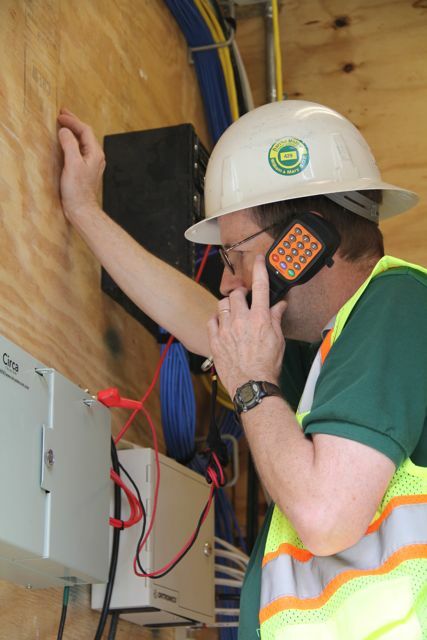 Concerned about the issue reported by the elevator installer, he double-checks a small central phone panel located inside the Community Building. It connects all the phone lines in the new complex to the main phone line. He is making sure there isn't anything out of place. The wiring looks fine so he'll continue troubleshooting other possible systems later. With that done, we leave the fraternity complex. One Tribe Place is an animal of a different stripe. Recently acquired by William & Mary, it was formerly the Hospitality House (a hotel located adjacent to the W&M campus). It is a large old building with aging infrastructure. The existing wiring is dated and unsuitable for a modern data network. Much of the IT work in this building is centered around bringing it up to our standards. We pull into one of the four garages and duck into a large closet area in the basement. 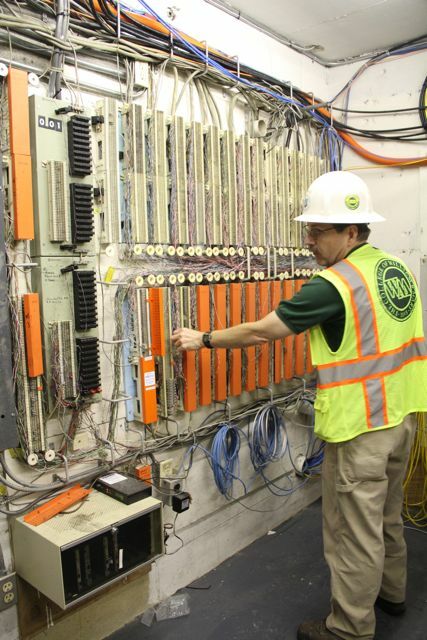 A large panel of analog phone lines covers one wall. "When we inherited the Hospitality House, we didn't know what these lines connected to. We had to "tone" each line to figure-out what was what." Jolly explains. "Toning" means sending a high-pitched sound signal through a wire to see where it connects. In the same closet, a large data rack was recently installed in the middle of the closet which will carry such things as Internet service and cable television to the floors where the residents will live. Walking into One Tribe Place's corridors, we find giant spools of cables being strung from one end of a hallway to another. They are being placed in a track along the walls as cutting into the ceiling is not an option. 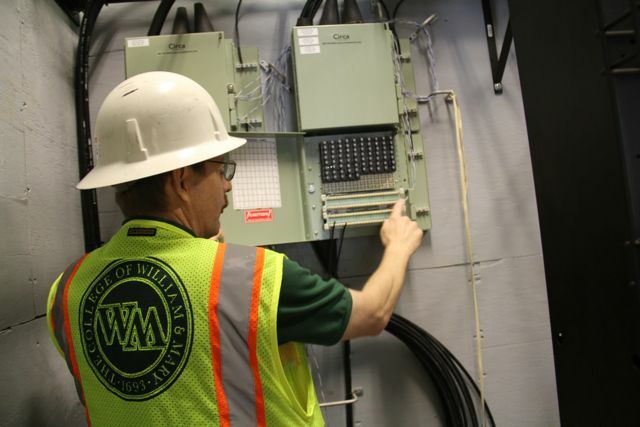 "Pulling cables" is one of the first tasks that IT has to do in any new building. Installations of most everything else (Internet access points, cable TV boxes, etc) must wait until the cable installation is complete. "W&M didn't get this building until June. And we (W&M IT) couldn't do anything in it for a long time. We now have to prioritize what absolutely needs to be done before students move in," Jolly notes. "And it will be a challenge to get even those things done on time." Demonstrating just how much work lays ahead of him, Jolly leads me to what used to be a housekeeping closet which is being converted into a networking closet. There are still towels on the shelves, leftover from its days in the hospitality industry. 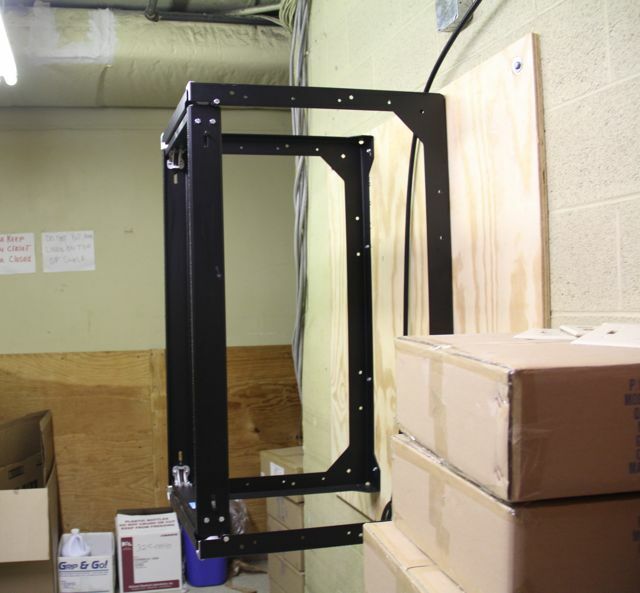 There is a black box-shaped metal frame hanging on a wall of the closet. This will be the data rack used to house IT services for the floor. However, the rack was just recently installed and it is currently empty. Obviously, there is still a lot of work to be done before services are up and running at One Tribe Place. In the final stretch of the summer break, W&M IT's Networking team is working on overdrive. 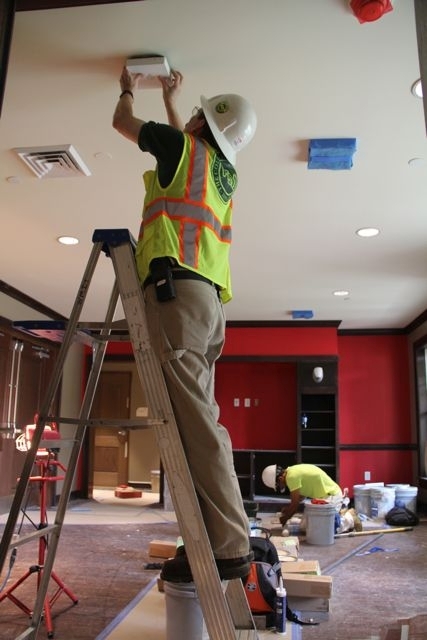 Construction, whether new or part of a renovation, always requires help from IT to complete the installations - and there has been a lot of construction this year. As we have seen on this tour, some buildings' IT infrastructure is almost finished and others still have quite a way to go. The goal is to get all buildings online by the start of the academic year.